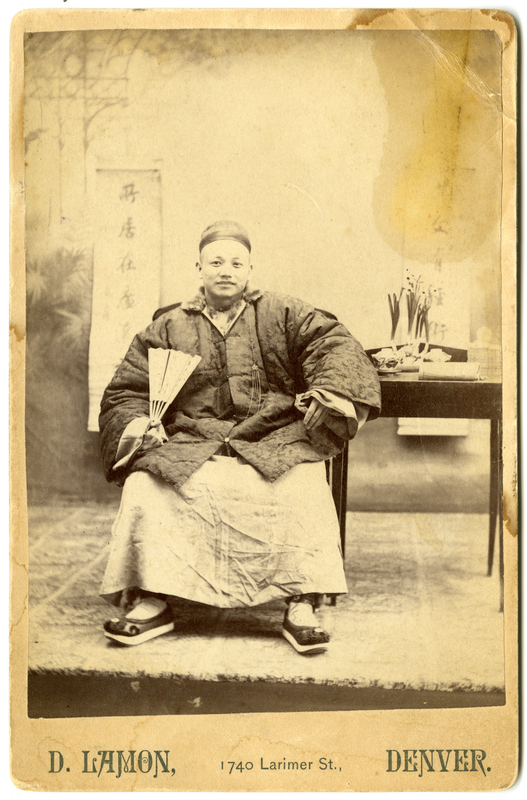 Prior to 1870, there were few, if any, Chinese people living in the city. As Americans moved westward, Chinese miners, railroad workers, and businesspeople were making their way from the West Coast to the interior states and territories of the United States. Many had initially emigrated from China with the hopes of making a fortune in the gold rush; they quickly found other avenues through which to make money, such as working on the railroads and in service jobs. Due to this interior migration, Denver’s Chinese population jumped from 4 in 1870 to 238 in 1880. Though the population was small, most Chinese migrants chose to live in LoDo because of its centrality. Since LoDo was one of the busier sections of Denver, they could easily set up businesses and find service jobs in the area. Typically, Chinese migrants established and ran laundromats. While the central location of Chinatown allowed for Chinese businesses to be profitable, it also made them a visible minority in a racially charged society. Anti-Chinese hysteria was ramping up throughout the American West and Denver’s Chinatown was vulnerable. In the 1870s, anti-Chinese sentiment spread to Colorado, as Euro-Americans increasingly viewed Chinatown with suspicion. Journalists published articles arguing that the Chinese were descendents of the Mongol Empire, suggesting that the Chinese threatened to take over the United States. They also linked Chinatown to societal vices, such as gambling, prostitution, and opium dens. Although there was no evidence that the Chinese engaged in these activities to a greater degree than Euro-Americans, Chinatown became a scapegoat for many of Denver’s issues. On November 1, 1880, newspapers throughout Colorado and the United States featured headlines about Denver’s “Bloody Riot.” On October 31, a violent mob formed in Denver’s Chinatown. What started as drunken saloon brawl between some intoxicated white men and two Chinese men quickly escalated. By nightfall, a full-fledged riot had erupted, as the mob attacked every Chinese person and business in sight. In the end, one Chinese man named Sing Lee was hanged, a number of others were brutally beaten, and almost all of the Chinese properties were destroyed. Chinatown’s residents reported that, in total, they had lost some $53,655 worth of property and goods, though some believe the actual number to be far greater. Although most of Denver’s Chinese residents decided to remain in the city despite the obvious dangers, Chinatown never fully recovered and the survivors never received compensation for their losses. By the turn of the century, Denver’s ethnic Chinese population began to shrink, reaching a historic low of 110 in 1940. Race riots, especially those targeting Chinese migrants, were frequent throughout the West during the 1860s and ’70s. Many of the largest such riots occurred in San Francisco and Los Angeles. 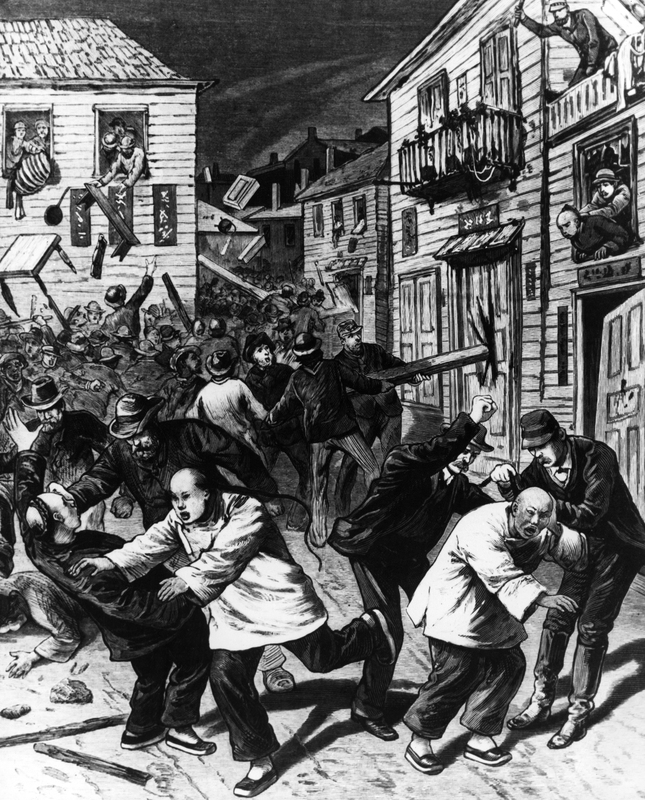 The Los Angeles massacre of 1871 and the San Francisco riot of 1877 were larger in scale, resulting in more casualties than the Denver riot. But, Denver’s riot was significant for its timing. It broke out only two days before the presidential election, and politicians increasingly focused on Chinese immigration as a national issue. Republicans, initially hesitant to embrace an anti-Chinese platform because their party had represented racial equality since the Civil War, now had to contend with anti-Chinese sentiment in the West. Denver’s Chinatown riot made it clear that, in order to hold power in the West, they were going to need to embrace the pushback against unrestricted Chinese immigration. Indeed, they did. In 1882, the Chinese Exclusion Act easily passed the House and the Senate. Marking an end to an era of unrestricted immigration to the United States, Chinese immigration was effectively banned. Moreover, ethnic Chinese migrants already living in the United States became ineligible for citizenship. The Chinese Exclusion Act remained in place for more than sixty years, until it was finally repealed in 1943. Although Denver is usually not the first city to come to mind when one considers the history of Chinese immigration to the United States, the establishment of the city’s Chinatown and its subsequent destruction had a profound impact on the history of race and immigration policy in the country. Liping Zhu, The Road to Chinese Exclusion: The Denver Riot, 1880 Election, and the Rise of the West (Kansas: University Press of Kansas, 2013). William Wei, “History and Memory: The Story of Denver’s Chinatown,” Colorado Heritage. (Denver: History Colorado, Autumn 2002). Colorado Daily Chieftain. (November 2, 1880).